Posted for Quilt Story's fabric Tuesday. 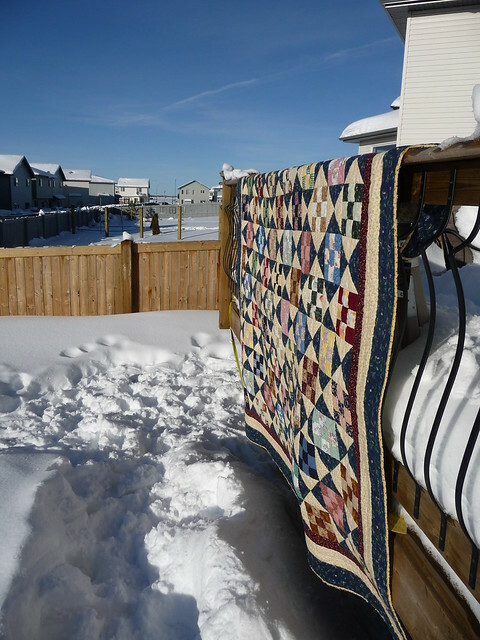 Finally have pictures of my finished nine-patch which I've named Prairie Traditions thanks to the fabric contributions from my mother, grandmother, Mom's neighbor and Mom's neighbor's sister. And myself - I contributed a few of the nine-patches, all of the borders, binding and backing. 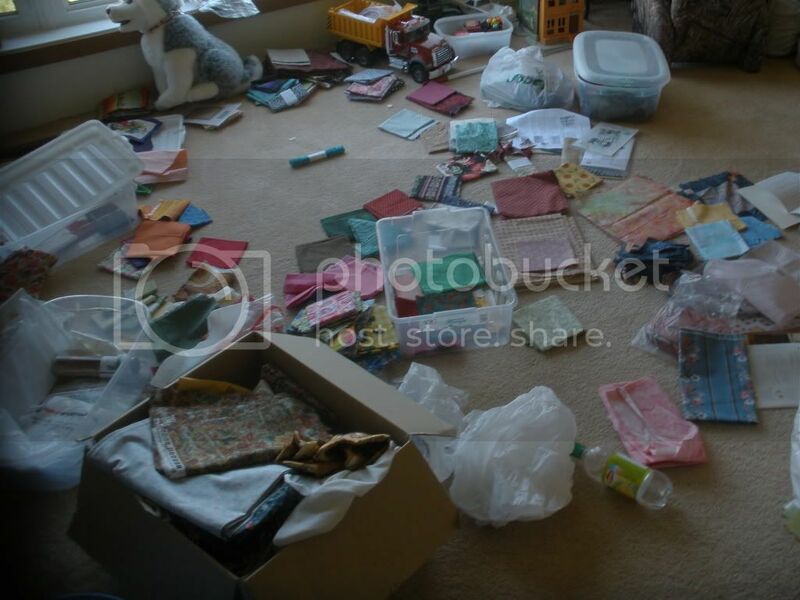 That is just her scraps, fat quarters and a box of the fabric from my grandmother. She has much more in the basement. Every time I go home, it seems a tradition for her to haul out fabric, WIPs, magazines, patterns and all that good stuff. I'm pretty sure she was trying desperately to get me back into quilting and it eventually worked. She never seems to make much progress using up this fabric, so I took it upon myself to start cutting and pieceing nine-patches for a pattern out of one of her magazines. This process took 9-10 years, I'm quite ashamed to say. I will say that I've come by my fabric obsession quite honestly. The back is flannel from my stash that I'd bought for another quilt top that has mysteriously gone missing through several moves. 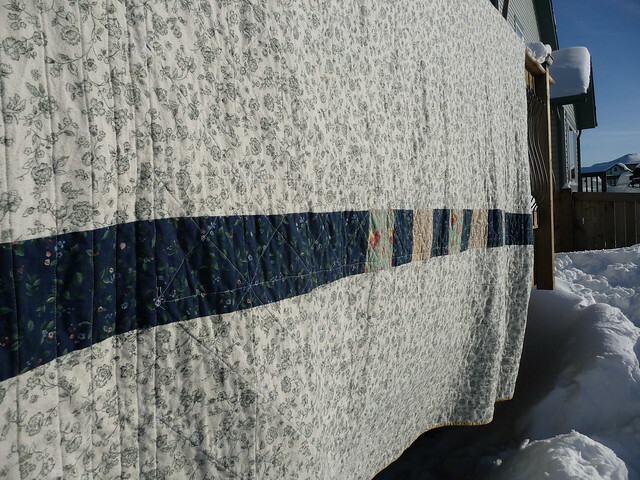 It wasn't wide enough for a queen sized quilt, so I added a pieced strip down the middle. The pieced strip is a chunk of leftover border that I suspect was meant to be used as the binding along with pieces of fat quarters I used in the quilt top. 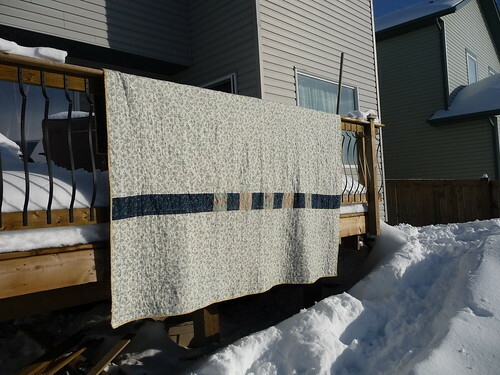 I quilted it in the ditch as well as diagonally through the nine-patch blocks and the borders were quilted in the ditch with an additional line running down the middle of each border. The binding is a yellow Debbie Mum print I had in my stash from a baby quilt I did years ago. I really enjoyed piecing this quilt and now that my grandmother is gone, I love seeing the fabrics in there that I picked out of stash she'd given to my Mom. 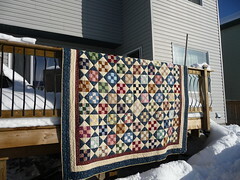 The quilt also includes bits of table toppers my Mom has made for me over the years. I get kind of sentimental about the fact that this quilt is now spread on my bed. It seems appropriate that Mr. Moose and I go to sleep every night under years of tradition passed down from generation to generation in my family as well as so many other families over the years. That is a beautiful quilt! You have shown that with dedication, scraps can become something beautiful over time. 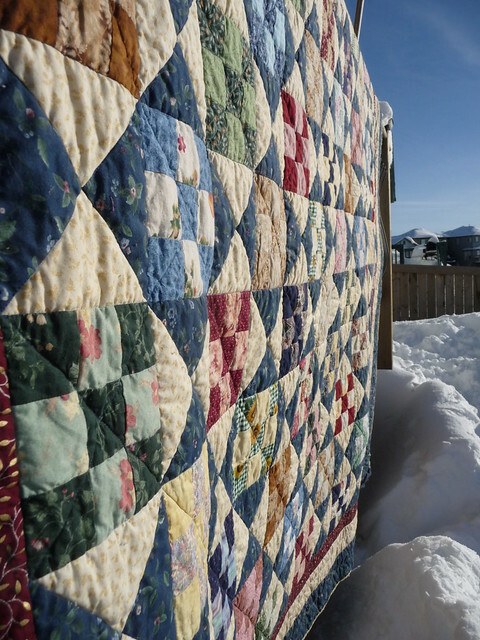 I love stories of ladies coming together to craft and using old scraps. Thta is one fancy quilt! Looks like alot of work. That is amazing having your grandmothers scraps. Beautiful!